LD sees opportunity (safe) to move puck behind net to RD... LW may be covered or less pressure on right side. Whether or not RD is in place behind net, OK to make an "area pass" if it's safe (no opposition nearby where you intend the puck to go and RD can get there first. When this occurs, everybody needs to get into position as depicted in next view. Positioning for weak side breakout. Weak Side breakout now takes on the same dynamics as strong side. RW positions at hash marks ready to put on the jets as the pass arrives. Alternatively, C, if open is timing his loop to get a pass from RD. If not, he's timing to get a pass from RW as shown next. 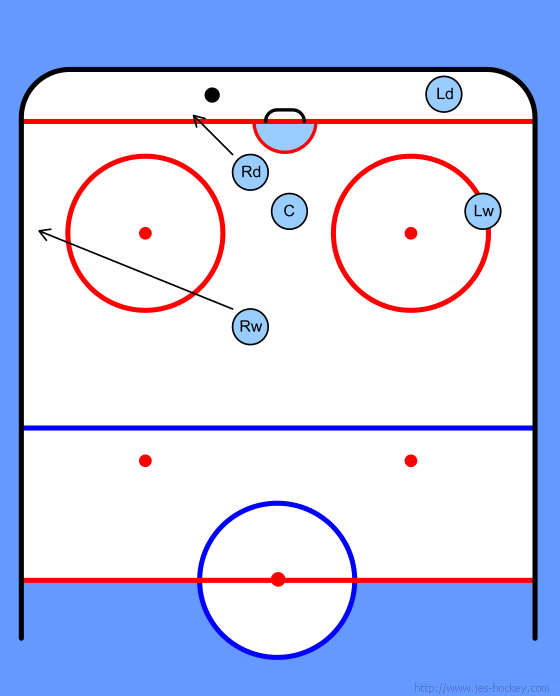 As RW gets pass, C is in position for short pass. 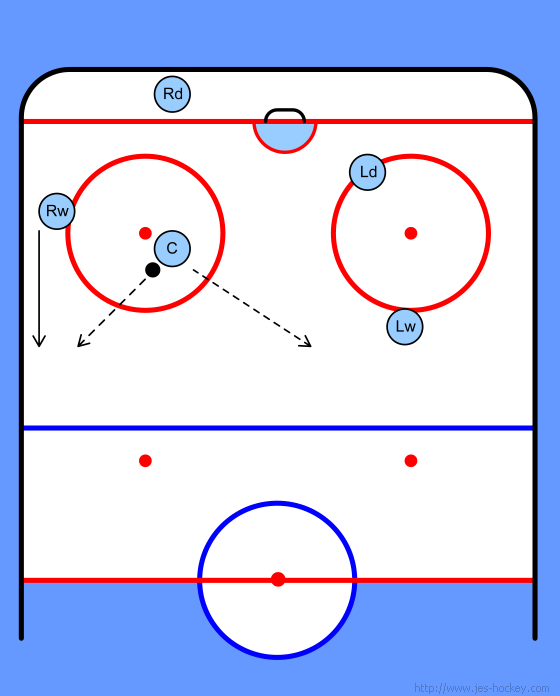 LW is in position for cross ice pass which should only be made if C is not open or RW can't skate with puck. If in trouble, RW should chip out of the zone. LW may be able to streak past D to get the chip all alone! 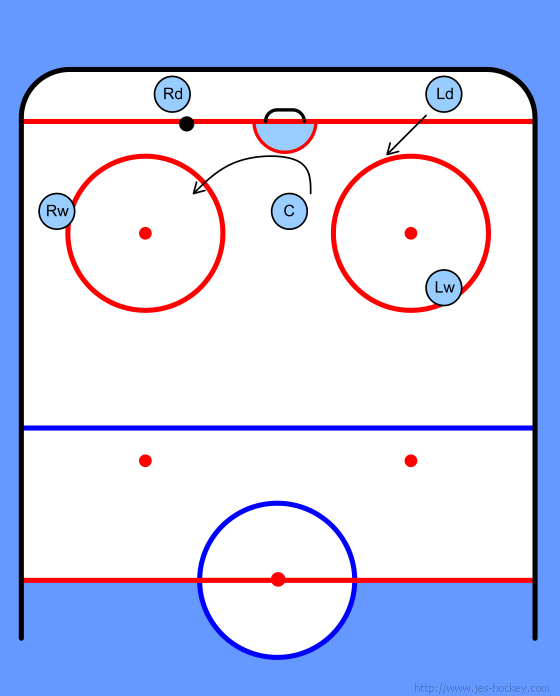 In this scenario C has puck and can pass back to RW (give and go), pass to left wing or skate puck out. 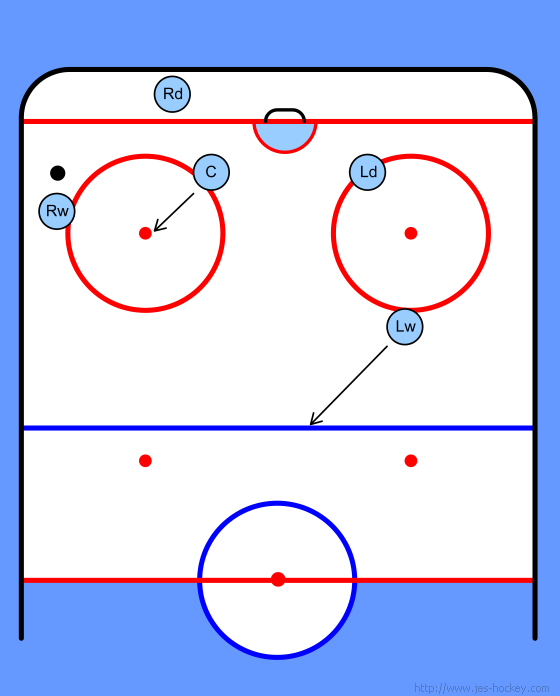 Again, if he is in trouble, the center can chip the puck out of zone into neutral ice for wingers to pick up.